During winter evenings, my cat curls up next to my chest, lets me put my arms around him, and snuggles with me all night. In the summer, he chooses the top of the fridge over my amazingly comfortable mattress, but still joins me in the morning (usually when he wants food). For a lot of you, this type of affection might seem normal for your pet. But with my cat, a black Bombay named Lu (Lucifer) that was rescued from the streets of Brooklyn, this is the biggest honor of my life. Lu’s affectionate in his own ways, but not the most cuddly. So the fact that he deigned me the most tolerable human in the house to huddle against during the colder seasons is something I won’t take for granted. Believe me, my boyfriend is more jealous than anyone you’ve ever seen. So there I am, relishing every moment Lu seems to be depending on me for something other than food for once. And for the first half of the night while I’m sleeping soundly, it’s nothing short of heaven. Then as I get restless I come to the number one cat owner dilemma. 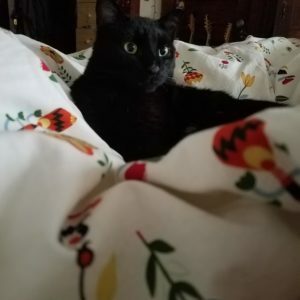 If I move and disturb our little Dark Prince’s sleep, I know he will quite literally grumble at me in annoyance and jump down, leaving me cold and lonely. Or worse, he’ll awkwardly sandwich himself somewhere near my legs, leaving me only a few inches of the mattress to spare. Yes, my cat has emotions like that, I swear. And yes this is normal for a cat owner (I hope). The benefits and drawbacks of letting your pet sleep with you have long been debated. According to Science Daily-about half of all pet owners co-sleep with their pets. Even further, Web MD states that 62% of cat owners sleep with their pet. If you have severe allergies, of course it is best not to sleep with your pet, especially if you notice it irritating you. Otherwise, the consensus seems to be that it is perfectly fine to sleep with your pet if you can tolerate it. It has never been definitively proven that you are at higher risk of disease. Plus, there seem to be at least a few benefits in it for you. According to studies, sleeping with pets can relax you and provide you with a sense of security. Not to mention warmth, if you aren’t already a hot sleeper. Some insomnia sufferers can only sleep with the comfort of their dog or cat next to them. Like many lessons about sleep, it’s really about what is comfortable to you. If you feel you are sacrificing a good night sleep just to make your furry friend happy, you may want to rethink your situation. Otherwise, snuggle away! 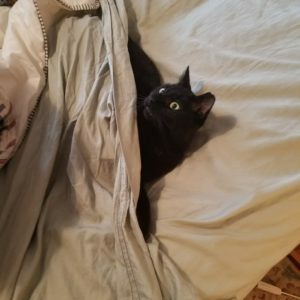 A few tips if you do choose to sleep with your pet- If you have a new pet, you should try to give them a neutral sleeping area before letting them into your bed. And when you do, it should be by invitation only. That way, if you find that you are uncomfortable on certain nights, your pet will have somewhere else to go without being traumatized. Plus, for dog owners specifically, invitation only sleeping will reassert your dominance over certain dogs that might become territorial or aggressive about their perfect spot on the mattress. Lu tends to be very restless any time I move around. And, at 4:45 in the morning on the dot (God knows why), he starts bothering me for his breakfast, meowing and wreaking havoc in the room. When this happens I am able to lock him out of the bedroom to get some extra shut eye, and he still has a few favorite spots around the house to settle into. In the end, it really comes down to the balance. If you train your pet correctly, you should feel comfortable kicking them out if you can’t sleep. But it’s a personal choice. I of all people know how hard it can be to part with your pet when all you want to do is cuddle, but sometimes it will be for both of your benefit. You don’t want to end up resenting Fido for tossing and turning all night. I know I’ll probably still hold on to Lu longer than I should to my own detriment, but I’ll enjoy every second of it. Maybe I’m too obsessed with my pet, or maybe I’m just a normal cat owner starved for the aloof animal’s attention. But I do what makes me happy, and you should too. That’s what it’s all about, right? 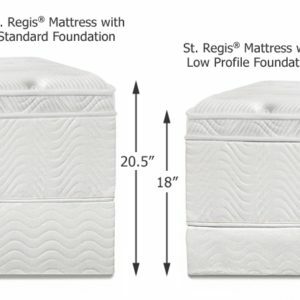 Foundation and Mattress- What’s the relationship? A new mattress can be really tall, making it feel like you are climbing a mountain to get into bed. That’s why good manufacturers ( like Charles P. Rogers) offer 2 options on the height of your foundation at no difference in price or performance; Low Profile or Regular Height. 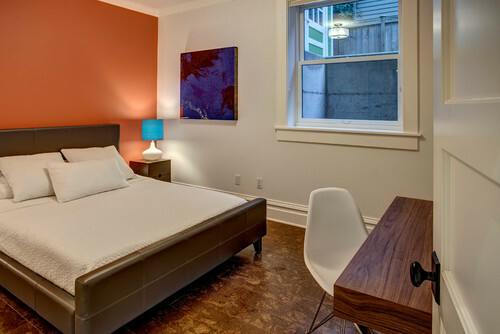 Why Get A New Foundation - Your new mattress, a significant investment, needs proper support. Many folks consider using their existing foundation rather than buying a new matching foundation: it’s seen like an add on rather than a necessary purchase. But ask yourself, why you are replacing the mattress? Poor comfort & support? Valleys & depressions? Your foundation could be as worn as your mattress, it wont give your new mattress proper support, nor proper alignment for you and your partner. Your brand new mattress might break down even more quickly than you’d like. 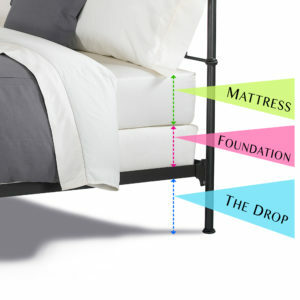 drop to the floor + height of the foundation + height of the mattress = height from floor to top of the mattress. Referring to our formula, first measure the drop from the rail to the floor. Then, add the height of the new mattress with the drop. Now it’s time to decide which foundation works best for you; low profile 5” or regular height 7.5” foundation. Plug in each foundation measurement (5” or 7.5”) to the equation, adding it to the drop and new mattress height you just calculated, and you will know the measurement from the top of your mattress to the floor. Compare the measurements to your current total height, and decide which works best for you. 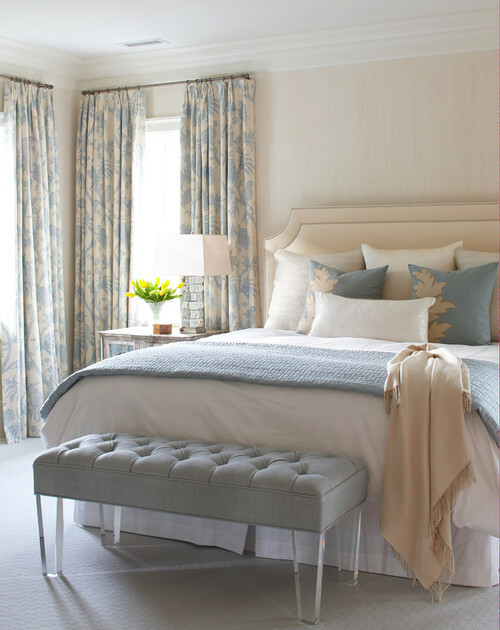 If using a bed skirt, you’ll need to find out the measurement from the floor to the top of the foundation to see which height is most appropriate for your bed skirt drop. 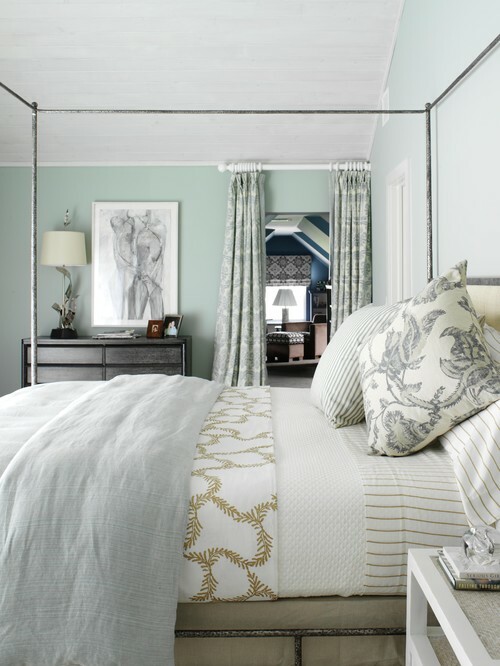 You will want to ensure the height of your new mattress and/or set scales well with your existing furniture and nightstands, and you are comfortable getting in and out of bed. 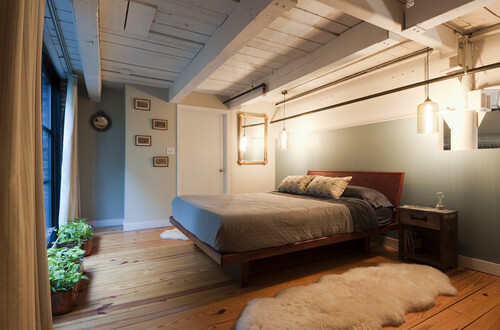 If you are putting a new mattress on a platform bed, measure the drop to the floor then add the new mattress height to know the measurement from the floor to the top of the mattress. 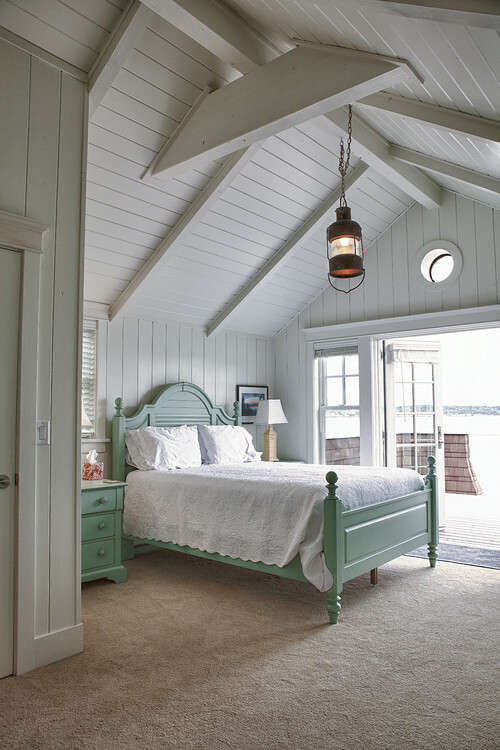 drop to the floor + height of the mattress = height from floor to top of the mattress. Let us know if you have any questions when you are doing your measurements. This little bit of math will help you decide which height foundation is best for you.